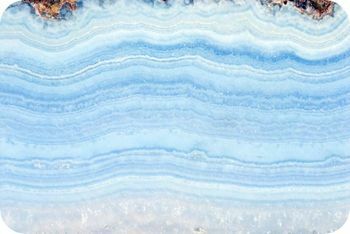 Blue lace agate is considered the “stone of Communication”. This stone is especially useful with the throat Chakra. It can ease the harsh edge off communication in difficult times; enhance public speaking, and smooth discussions. It also assists with tactfulness to speech and written communications. The stone is reputed to assist in communications with higher plains and angelic beings. All Agate have protective properties, however Blue Lace Agate is reportedly extra effective in calling upon angels for protection. There is also a calming, effect associated with this stone. It brings a lessening of anger, calming of nerves and increased calm and tranquility. These harmonious traits help to bring happiness and hope. This increase in harmony allows one to have stronger intuition and inner knowledge. We use Blue lace Agate a variety of our Chakra jewelry. We use it with the 5th, or throat Chakra. This chakra is associated with creativity and self expression, and is located at the throat. Blue is the associated color with the fifth Chakra.